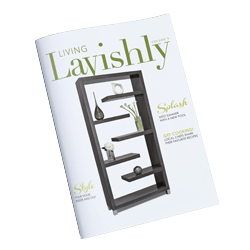 When we decided to produce a home decor and design magazine, we became excited about showcasing the wealth of talent and expertise we have here in San Luis Obispo County. To some, Living Lavishly takes place in their beach cottage, others in a vineyard estate, country club residence or eclectic family home. From the sunsets at the beach to the sunrise over a vineyard, from a stroll through the village of Arroyo Grande to wine tasting in the hills of Paso Robles, from hiking Bishops Peak to finding sand dollars on the beach in Morro Bay, we are living lavishly as we work, play, raise our families and build relationships that last. We hope that you enjoy the magazine as much as we enjoyed the process of the collaboration with so many amazing contributors. "Enriching our community within the relationships we build through connections, education & support"